With 100 miles of coastline stretching along the province, Barcelona is a beach lover's dream come true. Bustling Barceloneta may be the most famous, but it's hardly the end-all-be-all of beaches in Barcelona. From youthful, lively Nova Icària to tranquil Caldetes, there's a beach in Barcelona for everyone. When most people think of beaches in Barcelona, Barceloneta is probably the first that comes to mind. From drummers to sand-artists to singing donut salesmen, it may just be Barcelona's dirtiest, most crowded, and most touristy stretch of sand. However, that just means it's also the most entertaining. Without a doubt, there's always something going on at Barcelona's most famous beach. Plus, it's got some great seafood eateries along the shore in the eponymous Barceloneta neighborhood, a onetime fishermen's quarter that retains its old-world charm. With a prime location right on Barcelona's central coast near the Olympic marina and observatory, Nova Icària draws visitors from all walks of life. You'll find teens and young adults playing beach volleyball, parents chasing their giggling children along the shore, and so much more. Ready to step out of your comfort zone? Nova Icària is one of Barcelona's best beaches for watersports, with instruction sessions available in English that you can book online. Once you get tired and are ready to call it a day, head to the nearby Icària shopping center with its English-language cinema. Looking for something a bit cleaner and calmer than the busy central beaches? Bogatell is the place to be. It's about a 15-minute walk from Bogatell metro station, but well worth the commute. The beach itself draws a more mature crowd, giving it a much more tranquil vibe and making it a great place to chill out. It's also considered one of Barcelona's safest beaches (although you should always keep an eye on your belongings no matter where you are). Stick around in the evening to experience the neighborhood's fabulous dining scene and lively nightlife. 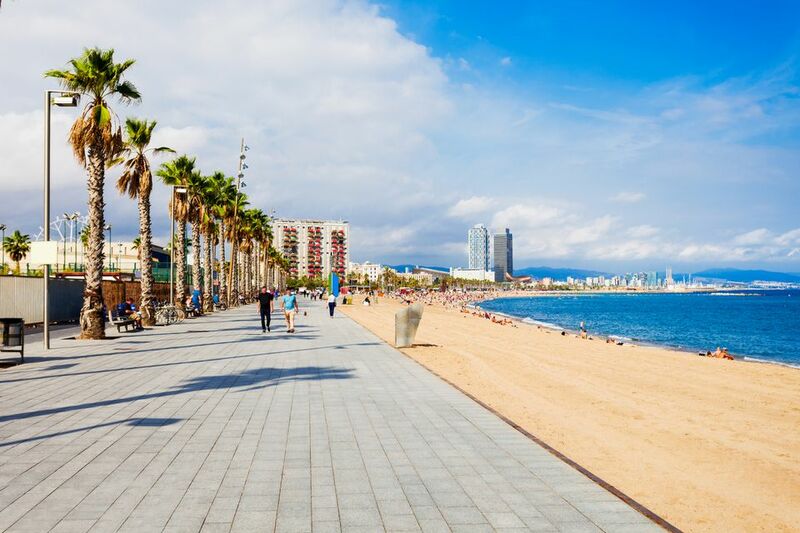 True to Barcelona's open-minded, friendly, and fun-loving culture, Mar Bella Beach is perfect for guests looking for a more cosmopolitan scene. It's perhaps most famous for its nudist stretch, part of which is discreetly partitioned off by a big dune beside the windsurfing center. The beach is also a favorite hangout for Barcelona's LGBT crowd. And in a city known for its iconic nightlife, the beach doesn't disappoint. If you're visiting on a Sunday in the summer, stick around after the sun goes down for the legendary late-night raves. Some of Barcelona's best beaches lie even further off the beaten path. Just a half hour train ride north of the city, Ocata is the definition of a hidden gem. Quiet, pristine, and flat, the spacious beach features fine golden sand and immaculately clean water. When you're done swimming, join one of the pickup rugby or volleyball games, or head to one of the dozens of nearby beach bars to refuel on tasty tapas and fresh seafood. All in all, Ocata is home to everything you could ever ask for in a beach. Want to have a whole beach practically all to yourself? Hop on the train at Plaça Catalunya in the city center and head up to the undiscovered coastal paradise that is Caldes d’Estrac, more commonly referred to as Caldetes. Few tourists even know this gorgeous gem of a beach exists, so you can relax and soak in the local lifestyle. Located in a peaceful, picturesque seaside village, Caldetes offers picturesque charm and a fraction of the crowds compared to Barcelona's more central beaches. The beach itself is definitely no-frills, but you'll find that you don't need all the extras at a beach this beautiful and calm. A tiny town teeming with history nestled along Barcelona's northern coast, St Pol de Mar—and its eponymous beach—is a gorgeous spot for a day trip. With clean, clear water and stunning natural landscapes, the small yet charming beach is a favorite among locals. The beach's defining feature is its enchanting cove, which has become somewhat of a nudist zone, next to the rain tunnel. It feels like it's a whole world away from the hustle and bustle in Barcelona, but you can get there from the city in just about an hour on the train. Let's swing down to the southern coast of Barcelona for a bit. Just 15 minutes south of the city center, Castelldefels offers a tempting five-kilometer stretch of sun and sand. Castelldefels has captured the attention of tourists in recent years, so it's on the crowded side compared to some of the more tranquil beaches near the city. However, that just means there's always something going on, so you'll never be bored. Plus, the fairly priced restaurants and shops nearby make it a great budget destination that won't break the bank. The great thing about Barcelona's beaches is that you can have a completely new experience just a few miles down the coast. Five minutes by train from Castelldefels, you'll find Garraf, which is comparatively quieter and more relaxing. The beach itself is just steps away from the station and offers plenty of useful facilities despite its small size. The tiny town of Garraf, along with its beach of the same name, aren't on most tourists' radar just yet. The warm water and views that look straight off of a postcard make it a favorite among Barcelona locals looking to escape the city. The town of Sitges actually has 17 beaches, but the popular destination half an hour away from Barcelona deserves a mention. Known as one of the region's most gay-friendly cities with an unbeatable nightlife scene, its central beaches are the place to be if you're looking for a fun crowd and plenty to do. Just want to relax away from the crowds? Head to the area north of the seafront church. The beaches on this stretch are better sheltered from the wind—and much quieter—but you're still close to the action. Tucked in between rugged cliffs and a charming fishermen's village, Calella de Palafrugell is one of Catalonia's most attractive seaside settings. Considered to be one of the Mediterranean's most beautiful coastal towns, its beaches can get a bit crowded during the summer, but the lovely area still enjoys a relaxed, laid-back vibe and serves as a beautiful escape from busy Barcelona. The town itself actually has several beaches, most of which are connected by a picturesque seaside promenade. The ancient Roman city of Tarragona has long been hailed as one of the best day trips from Barcelona. Transform your Tarragona getaway into a full weekend escape with a day at the beach in nearby Altafulla. Just a ten-minute train ride away, Altafulla is one of the highlights of the Costa Daurada. It offers miles of stunning white sand and a gorgeous, secluded cove beneath a ruined Roman fort. And if you want to get up and moving, there are plenty of watersports available during the summer. The Costa Brava is internationally famous for its rugged natural landscapes and stunning beaches, and nowhere is the essence of the region captured better than in Cala Llevadó. Located in between the towns of Tossa and Lloret de Mar, the steep, golden cliffs and marvelous crystal clear waters make it an ideal beach getaway for nature lovers. The town is also home to one of Catalonia's best campsites, which is easily accessible from the beach. Tossa might have a cheap 'n' cheery package holiday reputation, and as a result its beaches are packed with more tourists than locals. However, don't count it out just yet—its beaches are easily as good as anything in Catalonia. A medieval castle looms over the town and coastline from the southern bluffs, and the gorgeous natural rock formations surrounding the beach make a perfect backdrop. The picturesque town provides a great getaway from Barcelona with a fun international vibe. Tucked away in the pine woods just north of the popular seaside town of Blanes, Cala de San Francesc is unlike any other beach you've seen before. The lush green forest spills out onto a pristine white-sand beach that might just be the Costa Brava's best-kept secret. Despite its calm natural surroundings, the beach is still close to the action, with exclusive private villas and a small but happening town just a stone's throw away. Perhaps the most unique of Catalonia's myriad beaches, Sant Lluís provides a once-in-a-lifetime getaway for nature lovers. The pebbly beach, situated in the volcanic otherworld of Cap de Creus Natural Park, is just a short walk from charning Cadaquès. You'll have to take a bit of a hike to get to the beach via a stony scramble through olive woods. However, the walk is actually quite pleasant, and you'll be rewarded upon arrival with a stunning, unspoiled beach and unforgettable views.